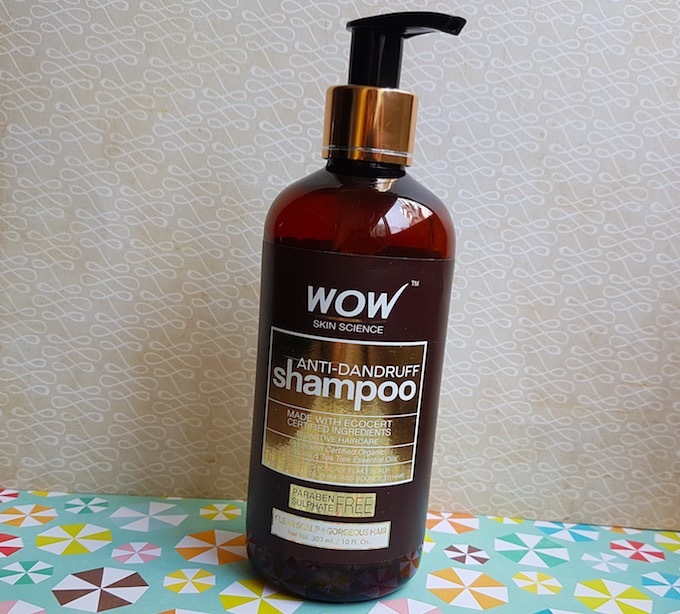 Hello everyone, my today’s review is about WOW Anti-Dandruff shampoo that I have been using for the past two months. I have been suffering from dandruff since my teenage years, and the main reason is my thick, dense hair. Due to the massive density of my hair, dirt and sweat accumulate very quickly on my scalp. And I have to wash my hair 3-4 times a week to keep it clean. 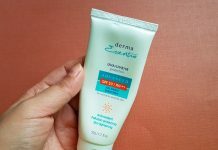 I tried many anti-dandruff products (oils, creams, shampoos, etc.) in the past and some worked whereas others failed. But the dandruff problem keeps on coming back till date. A few months ago I tried a conditioner from WOW brand, and I was quite pleased with the results. 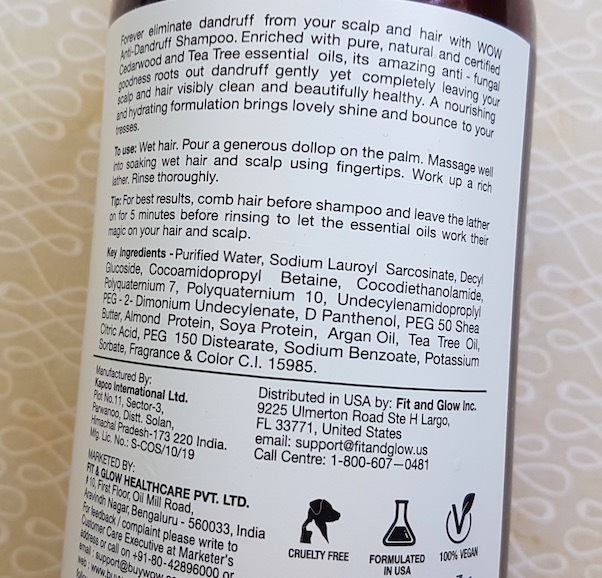 So I bought this shampoo with hopes that it will help in reducing dandruff and itch. Keep on reading to see whether it worked for my hair or not? 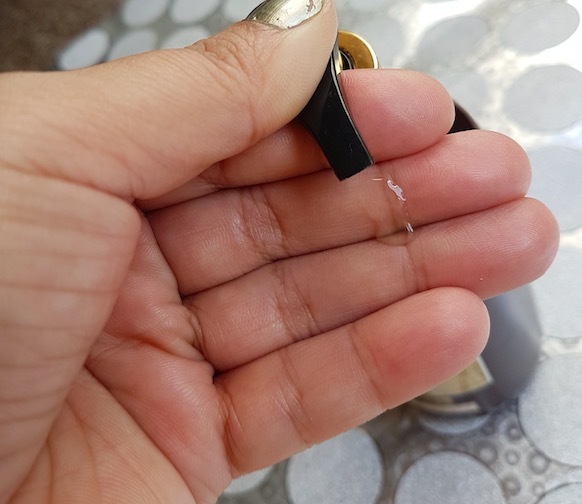 Packaging: WOW Anti-Dandruff shampoo comes in a brown coloured plastic bottle with a pump dispenser. I like haircare/skincare products that come with pump dispensers which make the products convenient to use. However, I’m little disappointed with this bottle as its pump doesn’t work correctly. 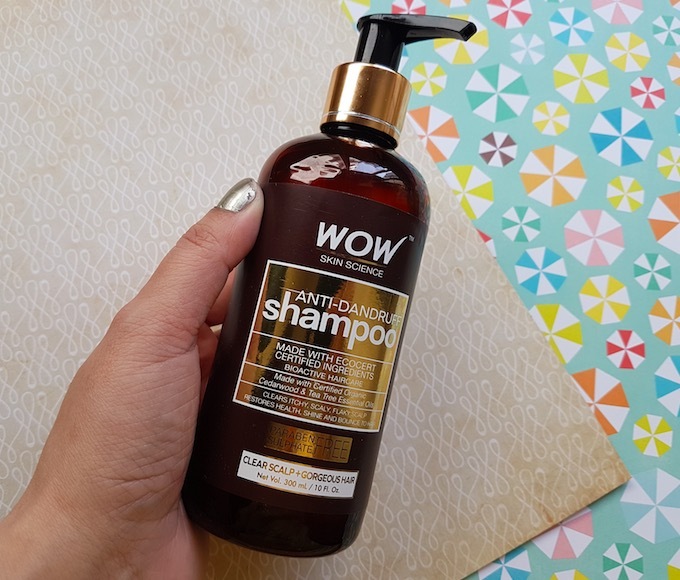 It dispenses a tiny amount of product in one go, and you need to press it several times to get enough shampoo for one hair wash.
Price & Availability: The cost of the WOW Anti-Dandruff shampoo is Rs. 499 for 300ml (I got it for Rs.345 from Amazon). 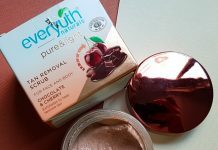 You can buy it from online websites like Amazon, Flipkart, Nykaa, etc. 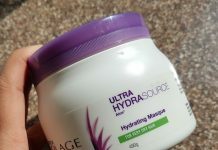 My Experience: The shampoo comes in a transparent gel form and has a fresh scent. I take a generous amount of the shampoo in a mug, add some water and apply that mix on my wet hair mainly focusing on the scalp. (As I have mentioned earlier that I have dense, thick hair, so I always dilute my shampoo with water to make sure it reaches to my scalp evenly). Then I massage the scalp nicely in a circular motion using fingertips for good 2-3 minutes. You can feel the cooling sensation on the scalp during its application. I keep it on for 4-5 minutes and then rinse it off with regular tap water. As I wash my hair 2-3 times a week, I don’t find the need of applying extra shampoo on my hair lengths. After washing it off, I follow it with conditioner and leave-in cream as usual. I must say each time after washing my hair, and scalp feels very clean and refreshed. It also helped in reducing dandruff and itch from my scalp. However, dandruff reoccurs if I stop using it, but its frequent use will surely help in preventing dandruff. The one thing which makes me skeptical about using it is the concern that it might fade my hair colour as the brand has not written about its compatibility with coloured hairs. It is infused with certified organic ingredients that are beneficial for our hair. 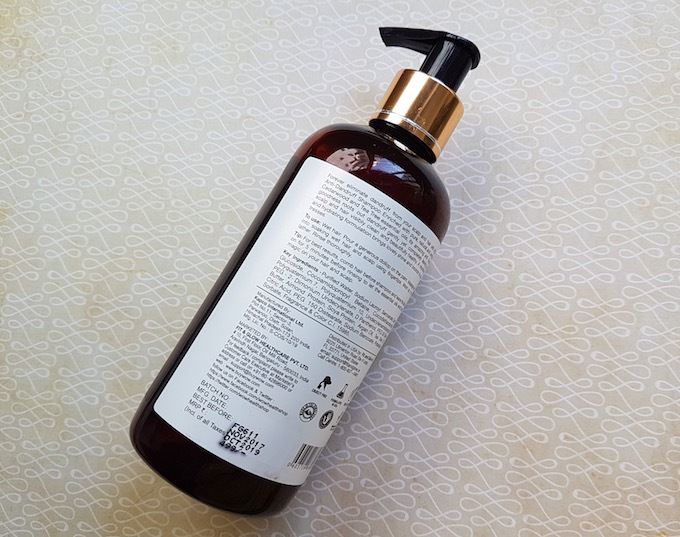 It removes dirt, oil and build-up from the scalp nicely, leaving the hair and scalp clean, fresh and refreshing. It washes off thoroughly without leaving any residue behind. A little amount of product produces a nice lather. It does help in reducing dandruff and itch from the scalp, and the consistent use will prevent them from reoccurring. I found it value for money. They should consider improving the packaging. It is not mentioned on the bottle whether it is safe to use on coloured hair. 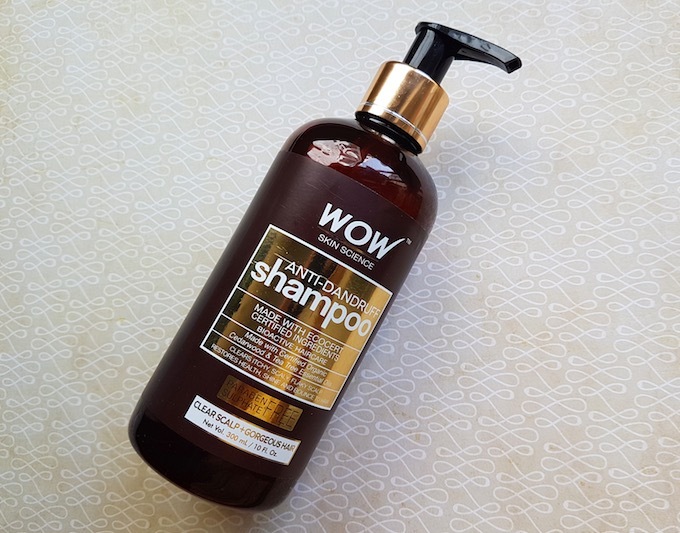 Overall, WOW anti-dandruff shampoo cleanses the hair and scalp nicely and gives a fresh, clean feel. It helps in reducing dandruff and itch on the scalp when used frequently. I will surely repurchase it and will recommend it to anyone who is looking for an effective anti-dandruff shampoo. Can women use this Shampoo? The price for this shampoo is ridiculously priced. How about loose $10 off of it and you might even make more $.